Six months ago today, Super-storm Sandy devastated a large section of the northeastern United States. The flooding caused by its record storm surge was a heart-wrenching example of the dangers posed by rising sea levels. Storm surge is the rise in sea height that occurs during an intense storm like a hurricane or nor’easter. Its baseline is local sea level. So, as sea levels rise, storm surges are able to reach further inland. This is a serious problem for coastal communities around the world. According to climate scientists, the average global sea level has risen about eight inches since 1880. This may not sound like a lot, but it is a significant amount when you consider it is spread out across all of the world’s oceans. That said, sea levels are not rising evenly across the planet. Recent studies have found that certain areas, such as the East Coast of the US, are experiencing faster rates of sea level rise than others. New York Harbor, for example, has seen its water level increase by more than a foot in the past century. Sea level rise has two main drivers. They are thermal expansion – a process in which water expands as it warms – and the melting of massive amounts of land based ice, such as glaciers and ice sheets. Both are the result of rising global temperatures. In the future, sea levels are expected to continue rising as our atmosphere warms. Estimates of how much vary from four inches to two feet above current levels by 2050. This wide range reflects uncertainty in the amount of future greenhouse gas emissions, subsequent warming, and rate of ice melt. What is certain, however, is that the frequency and magnitude of storm surge flooding will increase as sea levels rise. Are you concerned about the quality of the air you breathe? Air pollution, a by-product of our industrial age, is an ongoing problem in many parts of the United States. According to the American Lung Association’s annual State of the Air Report, released yesterday, 42% of Americans live in counties with unhealthy levels of particle and ozone pollution. Particle pollution comes from a variety of sources, but chief among them are industrial emissions and vehicle exhaust. When these emissions react with the U.V. light of the sun, they form ground level ozone. In addition to contributing to climate change, both of these pollutants are known to have serious negative impacts on human health. They especially affect individuals suffering from respiratory and cardiovascular diseases. In spite of these current pollution challenges, the report also highlights the success of the Clean Air Act and the fact that our nation’s air, overall, is cleaner now than it has been in the past. Click here to see where your county’s air quality ranks. Gaylord Nelson, a US Senator from Wisconsin, is credited with organizing the first Earth Day on April 22, 1970. Rallies were held across the country and millions of people came out to protest against rampant industrial pollution and the deterioration of the nation’s natural environment. These events led to the creation of the EPA and the passage of the Clean Air Act, Clean Water Act, and the Endangered Species Act. 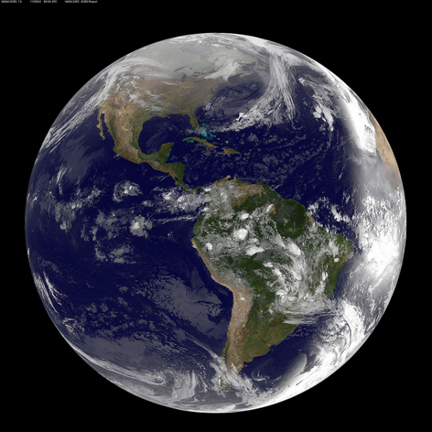 Today, 43 years after the original, Earth Day is an international holiday celebrated in 192 countries. These continuing efforts to raise environmental awareness are more important than ever as our global society faces the challenges of Climate Change. March 2013 was unusually cool across most of the eastern United States, including here in New York City. For much of the rest of the world, however, it was warmer than average. According to NOAA’s National Climatic Data Center, March 2013 tied March 2006 as the tenth warmest March on record for the entire globe. The planet’s combined average temperature for the month – over both land and ocean surfaces – was 55.14°F, which is 1.04°F above the 20th century average. March 2013 also marked the 337th consecutive month that our global temperature was above its long-term norm. That means the last below-average global temperature for any month was February 1985. There will never be another Hurricane Sandy – at least not in name. The World Meteorological Organization has announced that it is officially retiring the name from its list of Atlantic cyclones. The WMO is responsible for naming tropical storms and hurricanes around the world. It maintains a set of six rotating lists for each hurricane-prone region. After a six-year cycle, names are re-used. Names are only retired when a storm was particularly noteworthy – causing a large number of fatalities or an extraordinary amount of damage. In terms of Sandy, the late October storm claimed the lives of 72 people and caused more than $50 billion worth of damage in the United States alone. Sandy is the 77th name to be retired from the Atlantic list since the current naming system began in 1953. It will be replaced with Sara beginning in 2018, when last year’s list is recycled. Some other retired Atlantic Basin names include: Andrew, Katrina, and Irene. The Big Apple had a sweet, but brief, taste of summer this week. The city’s high temperature reached 82°F on Tuesday, which is 23°F above average.The warm conditions did not last long, however. In fact, they ended with a bang as a severe thunderstorm rolled through the area mid-week. Producing strong winds and heavy rain, the storm ushered in cooler air and brought temperatures back to more seasonable levels. Despite the rollercoaster-like sensation that dramatic temperature swings produce, this recent warm-up was a welcome change of pace for many winter-weary New Yorkers. On Thursday, April 4th, Columbia University’s Lamont-Doherty Earth Observatory will be hosting a public lecture, “The Science Behind Sandy”. Adam Sobel, an atmospheric scientist and professor at Columbia, is expected to address many of the meteorological questions raised by the historic storm. Some of these include: What kind of storm was Sandy? How rare was it? Can we expect more storms like it in the future? In light of the catastrophic damage that Super-storm Sandy caused in the New York City area, and the current debates on how to re-build, this talk should be very informative. For more details, please visit the LDEO website. 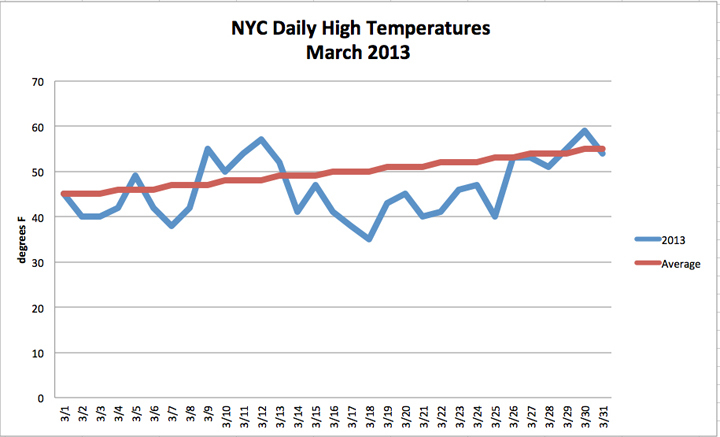 March roared like a lion in New York City this year, with cold and blustery conditions dominating the month. 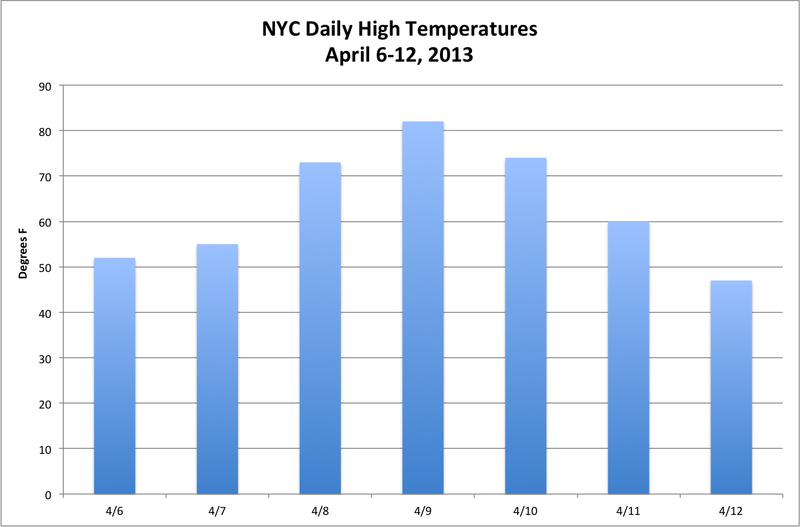 With all but ten days posting cooler than normal readings, the city’s average monthly temperature only reached 40.1°F. That is 1.9°F below normal. In fact, this was the first March in twelve years that we did not have a single day break the 60°F mark. This was a huge departure from last March, which was the second warmest March on record for the Big Apple. In terms of precipitation, snowfall was abundant. March usually brings the city 3.6 inches of snow, but this year we saw 7.3 inches accumulate in Central Park. Rainfall, however, was scarce. The city only collected 2.90 inches, which is 1.46 inches below normal.